The endodontium consists of mineralized (dentin) and nonmineralized (pulp) portions, and encompasses the functional-anatomic relationships of the dentin-pulp system. The odontoblasts are densely aligned along the inner surface of the dentin. Their processes extend through the entire dentin layer to the dentinoenamel junction, and are up to 5 mm long depending on the dentin thickness. The odontoblasts are interconnected through gap junctions as well as tight junctions. These cells synthesize the primary dentin, consisting of type I collagen, glycoproteins, and gly-cosaminoglycans. This organic precursor later becomes mineralized at some distance from the odontoblast layer. The majority of the dentin is referred to cir-cumpulpal dentin and is located between mantle dental and the pulp chamber. Mineralization begins only when the predentin has achieved a certain degree of histologic maturity. The odontoblastic processes course within the dentinal tubules. Between the cytoplas-mic membrane of the processes and the canal wall there is often a periodontoblastic space that contains tissue fluid and collagen fibrils, as well as dentin matrix. The very densely mineralized peritubular dentin covers the dentin canal wall. It is not found in predentin. Its thickness depends on patient age, but it may also be laid down as a defense against external influences. Dentinal tubules with small lumens and thick peritu-bular walls appear as a translucent zone when viewed in ground sections under a light microscope; this zone is called sclerosed dentin. The dentinal tubules are separated from each other by less densely mineralized intertubular dentin. The peripheral layer of dentin exhibits highly branching odontoblastic processes referred to as mantle dentin. In contrast to the circumpulpal dentin, this layer is less densely mineralized. Dental enamel is attached to the mantle dentin. As demonstrated by R.M. Frank and coworkers, nerve fibers also extend to the dentinoenamel junction. Thus the vitality of dentin tissue is not the result of hydro-dynamic transfer of irritation, as was long believed, but rather for the most part on direct nerve conduction, i.e., the nerve endings are directly stimulated. The pulp consists of loose connective tissue. In addition to odontoblasts it contains fi-broblasts, replacement cells, and defense cells. The fibroblasts represent the largest cell population, and appear as inactive and active cells, the latter producing the intercellular substance and collagen precursors. Replacement cells are undifferentiated mesenchymal cells that cannot be differentiated from fi-broblasts by shape. These cells may replace odontoblasts as well as defense cells, and assume their functions. A Structure of a secretory odontoblast. 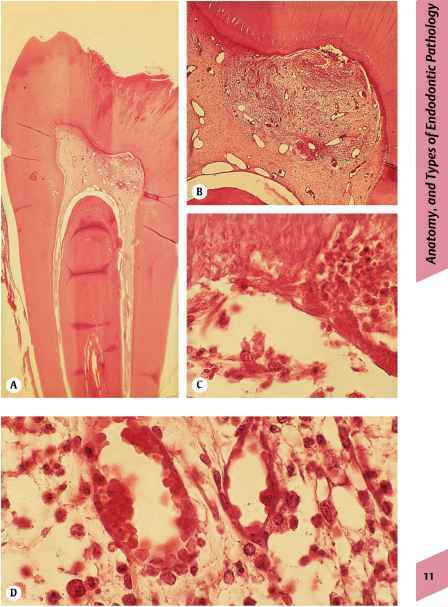 B Formation of circumpulpal dentin: Predentin, secreted by odontoblasts, mineralizes at a distance ca. 20|im distal to the odonto-blasts, emanating from focal centers that accumulate as calcium globules (circles). These aggregate in the subsequent mineralization process. At this time, the formation of peritu-bular dentin begins. 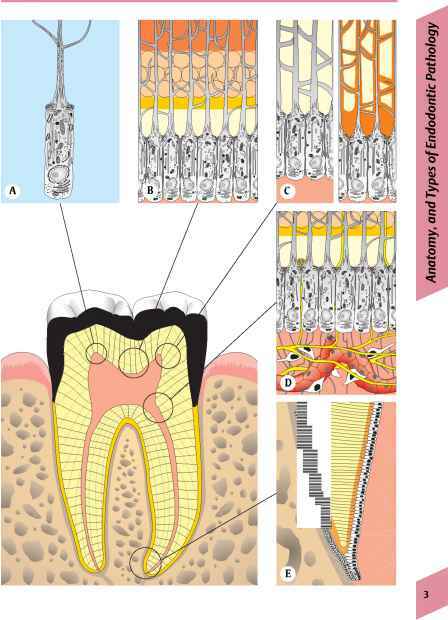 C The formation of secondary as well as intertubular dentin (dark) reduces the size of the pulp chamber as well as the dentinal tubules (right). 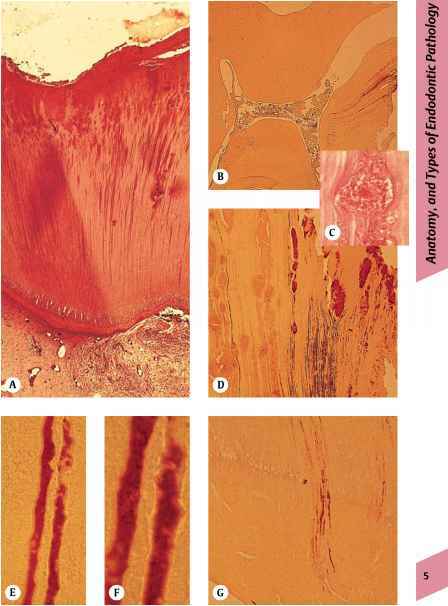 D Zone-like formation of the coronal pulp from the odontoblastic zone (middle), subodontoblastic, cell-poor zone, and cell-rich bipolar zone (below). The latter is characterized by fibroblasts, undifferentiated replacement cells, and the Raschkow nerve plexus. E The Hertwig epithelial sheath induces the differentiation of ectomesenchymal cells of the tooth bud into odontoblasts. Enamel caries, clinically detectable as an opaque discoloration, is reversible. Initial caries is divided into three zones: On the advancing caries front, a translucent layer is visible; a dark zone is attached. The body of the lesion represents the third zone, suprajacent to the apparently intact enamel surface. Dentin caries is differentiated into early and advanced lesions: In an early dentin carious lesion histologic changes occur without enamel cavitation, whereby plaque toxins diffuse through the enamel and cause secondary (reparative) dentin formation as well as early accumulations of inflammatory cells. 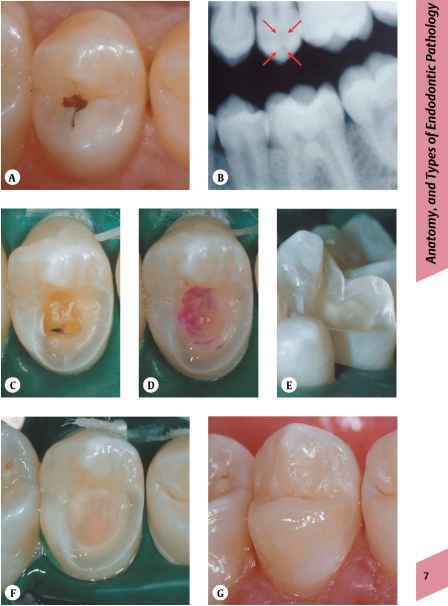 If the cause is eliminated, partial regression of dentin caries can occur at this stage. 6 reparative (secondary) dentin forms on the pulpal wall. Clinical examination alone is not sufficient to determine the depth of the carious lesion in occlusal fissures. In a study by Tveit, teeth that were scored as noncarious clinically were examined histologically and only 10% were caries-free while 76% already exhibited enamel caries. Of 131 lesions with small occlusal cavi-tation, 41 already exhibited dentin caries, which had only been detected by clinical probing in 31 instances. In a study of the influence of clinical probing, in one group teeth were only examined visually, others with probing. One week later, the teeth were extracted. The histologic examination revealed only seven carious defects in the group with out probing, but after clinical probing 60 defects of tooth hard structure were observed. In addition, in this group there was even evidence of tooth surface destruction into the dentin. Radiographic diagnosis doubles the sensitivity for detection of fissure caries. However, more than half of even deeper dentin lesions remain undetected. The capability of detecting carious teeth (sensitivity) is 12% with visual diagnosis alone, 14% with probing, and 20% with the use of magnifying loupes. Only with the additional use of bitewing radiographs was it possible to increase the sensitivity to 49%. In a study of proximal carious lesions, 66% exhibited opaque enamel discoloration, 32% of the teeth showed small lesions, and 1.3% pronounced cavitation. In teeth with a radiographic index of grade 1 (enamel), 13% exhibited clinical dentin caries, and with a radiographic index of 3, 58% exhibited cavitations. There was no direct correlation between radiographic findings and actual clinical observations. In the posterior arch segments, only 30% of carious lesions can be conclusively determined using bitewing radiographs. C4 lesions (deep dentin caries), however, can be precisely detected. In almost every case, the histologic picture of caries is more advanced than what the radiograph shows. Experience and degree of training enhance caries diagnosis. Experienced practitioners interpret radiographs more cautiously. Dental students, on the other hand, too often diagnosis caries, with the danger of "overtreatment." A/B Penetrating advanced dentin caries, with carious opening into the pulpal tissue and adjacent necrosis. C/D Dilation of the dentinal tubules as ampullae and garlands (zones 1-3). E/F Bacterial expansion of dentinal tubules. G Bacteria can also penetrate into a tubular reparative dentin (zone 6). In the absence of any therapeutic measures, profound caries caused by infection will lead to an inflammatory host response within the pulp, and the ultimate consequence will be necrosis. The goal in tooth maintenance is therefore to completely remove all infected tooth substance. In this way, the further progress of toxins, antigens, and bacteria can be effectively inhibited. Use of special color indicators can significantly simplify such clinical treatment. The cause of dental caries is bacterial infection. Since the spatial expanse of carious involvement cannot be absolutely determined, if any diseased tooth structure is left behind, more or less high concentrations of bacteria near the pulp can be expected. This sort of compromise during treatment does not provide true causal treatment of the infection. Even if the number of remaining microorganisms can be significantly reduced following definitive treatment, there remains a long-term risk of remaining caries and the danger of pulpal involvement. Combating bacteria with topical medicaments (e.g., calcium hydroxide-based), even in the most optimum experimental conditions, does not lead to sterile relationships. For this reason alone, the removal of caries must be complete, even when there is a danger of opening the pulp chamber. This is supported by the fact that the pulpal tissues are either acutely or chronically inflamed if the carious process has already reached the pulp. If the pulp chamber is opened during clinical removal of carious dentin, vital extirpation must be performed. If carious dentin is completely removed and the pulp is accidentally opened in an area of healthy dentin, direct pulp capping can be performed. Following application of a caries detector solution, dentin caries exhibits a distinctive red coloration; in dentin regions very near the pulp, where a high number of dentinal tubules exist, a (reversible) pink color is characteristic, but this is not indicative of a carious process. The effective, positive use of the caries detector was demonstrated in a long-term study of 224 cavities. Neither after one, nor after three years' observation was it possible to diagnosis any "recurrent caries." During exami nations five to six years later, four carious lesions were detected beneath the restorations and three immediately adjacent to the restorations. The stainability of carious dentin does not result from demineralization, but from the caries-induced alterations in collagen structure. The removal of the stained dentin leads to complete elimination of bacteria. In some patients, the caries detector will reveal infected dentin beneath natural staining. In such cases, it is important to recognize that the lack of reaction by the pulp-dentin complex in nonvital teeth results in bacteria progressing uninhibited into the dentin. With complete elimination of the infection, and because of minimum preparation trauma resulting from the selective carious removal, it is possible to reduce to a minimum any noxious effects on the pulpal tissues. In addition is the fact that the caries detector solution is harmless and aside from rare and minor pain sensation, it does not cause pulpal irritation during preparation. The caries detector is a valuable aid for complete elimination of infection during treatment for caries. If endodontic intervention becomes unavoidable, the caries detector provides a valuable enhancement in keeping with accepted principles of asepsis. The pulp cannot be directly inspected or examined. Except for pain, all other symptoms of inflammation cannot be adjudged. 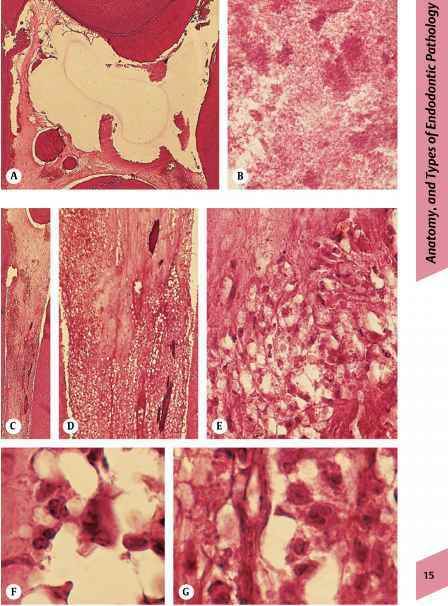 In accordance with the reports by Baume and other authors, a clinical classification of pulpal inflammation has been presented as four groups: (1) asymptomatic and (2) symptomatic reversible inflammation, (3) irreversible phase, and (4) pulpal necrosis. • Asymptomatic pulp pathology is painless. The tooth responds positively to a vitality/ sensitivity test. The carious process may extend deeply into dentin, but not into the pulp. • With reversible pulpitis, pain is elicited by cold, sweet, or sour and the carious process has not yet invaded the pulp. Percussion of the tooth is negative or inconclusive. • With irreversible pulpitis, pain may occur spontaneously, and increase with heat. The percussion test is usually negative, but may be mildly positive. • With pulpal necrosis, pain may be absent or may be extremely severe. The sensitivity test is negative or extremely positive and, in some patients, the radiograph may depict a periapical lesion. Initial histologic manifestations of inflammatory reactions within the pulp occur during the progression of enamel caries into dentin. The odontoblastic processes end at the denti-noenamel junction in a layer of sclerosed dentin, where peritubular dentin is formed, followed by mineralization of the odontoblastic processes. At this site, numerous bacteria reside. If the carious process is superficial and chronic, one notes formation of secondary dentin and mild inflammatory cell infiltration, in addition to reduction of the odontoblastic layer. With active caries, on the other hand, there is a massive inflammatory cell infiltration with only minimal secondary dentin formation, in addition to pathologically altered odontoblasts. The lysosomal enzymes released by damaged neutrophilic granulocytes and macrophages lead to endothelial cell necrosis, and the consequence is increased vascular permeability and a resultant extracellular edema. At this stage of the carious process, nerve fibers appear to be only relatively minimally damaged. 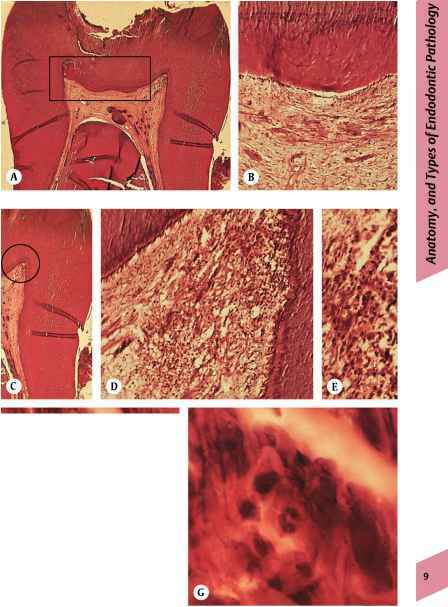 The area of inflammation expands, but is localized only to small foci within the coronal pulp, without endangering the remaining pulpal tissue. Pathologic mineralization along the canal wall, as well as initial denticle formation, may also occur. During inflammation, endothelial cells within the blood vessels are activated to express adhesion molecules, which elevate the attachment of circulating leukocytes. This, and a slowed blood flow, permit the neu-trophilic granulocytes to attach to the en-dothelium and extravasate into the neighboring pulpal tissues. Upon the surface receptors of macrophages, e.g., CD 14, bacterial lipopoly-saccharide (LPS) binds, which can be released within the dentinal tubuli upon death of gram-negative bacteria. 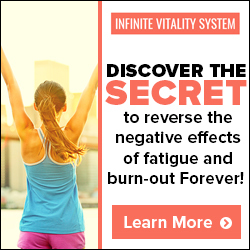 This activates macrophages, which secrete cytokines and chemo-kines that enhance inflammation. For example, the cytokine TNF-a can activate endothelial cells to release IgG and complement and activate leukocytes, which leads to extravascular edema and therefore to pain. IL-1 and IL-6 elicit lymphocyte activation and therefore elevated antibody production; IL-8 attracts neutrophilic granulocytes, basophiles, and T cells to the focus of infection, and IL-12 induces CD4 T-cells to TH1 cells. A Secondary (repair) dentin and denticle formation adjacent to the advanced dentin caries. 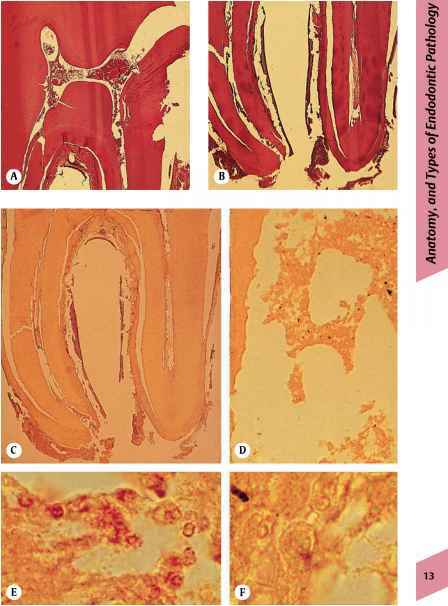 B Secondary dentin has only few tubules and is bordered by few odontoblasts. C Within the pulp horn, one notes an accumulation of inflammatory cells. D/E Note the initial disintegration of the odontoblastic layer and the obvious inflammatory cell infiltration, without tissue necrosis. F Bacteria infiltrate coronally into dentinal tubules. At the pulpal wall, neutrophilic granulocytes migrate toward adjacent tubule entrances and release tissue-destructive enzymes. G Neutrophilic granulocytes, evident in the predentin layer and within dentinal tubules. After bacteria invade into the dentinal tubules, neutrophilic granulocytes migrate in the direction of the tubule entrances near the pulp; there, the granulocytes die and release lysosomal enzymes that destroy pulpal tissue. During the subsequent phagocytosis of the destroyed tissue by polymorphonuclear or mononuclear phagocytes, the uptake of cellular debris leads to additional release of lyso-somal enzymes, with subsequent tissue destruction and a chemotactic attraction for additional inflammatory cells. The offensive agents that enhance the inflammatory reaction are bacteria and their metabolic and breakdown products, as well as the products of decomposition of the dentin itself. A vicious circle is initiated, which manifests itself as an irreversible pulpitis. In areas near to the necrotic regions, the pulpal tissue becomes saturated with neu-trophilic granulocytes, which phagocytize bacteria. This elicits the disintegration of large areas of the pulp; this process expands in an apical direction. However, the histologic picture of an acute inflammation with prevalence of acute inflammatory cells does not necessarily mean that all clinical symptoms of acute inflammation will be present. In more than 25% of all cases of deep caries with partial pulpal necrosis and severe inflammation, no history of pain symptom is reported. The depth of the carious process also does not correlate with the occurrence of pain. In cases of irreversible pulpitis with necrosis, there is almost always a widening of the apical periodontal ligament space. The etiology of this early periapical reaction appears to be toxin penetration through intact pulpal tissue. Endotoxin, released from the external membrane of gram-negative bacteria (LPS), can also elicit the complement reaction. Complement activation affects a release of biologically active peptides, the consequence of which is an increase in vascular permeability and attraction of neutrophilic granulocytes and macrophages. Lysosomal enzymes that are released during phagocytosis cause the actual tissue destruction. Small complement fragments, especially C5a, can induce local inflammation and intensify it. C5a also activates mast cells, mediators of histamine and TNF-a release, all of which intensify the inflammation. Tempering the destructive effects of the complement system and the rapid elevation of its activation by the enzyme cascade, there are also complement-regulating proteins that can inhibit excessive tissue destruction. In sum, the complement system is one of the most important mechanisms through which pathogens are recognized and an effective defense against bacteria and their metabolic products is raised. In cases of irreversible pulpitis, it is impossible to maintain the vitality of all pulpal tissues. At this stage of the inflammatory process, vital extirpation is the treatment of choice. A The advanced dentin caries beneath the fissure has reached the pulpal tissues; note the accumulation of inflammatory cells. The root canal pulp exhibits several diffuse calcifications, but is inflammation-free. 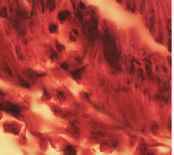 B Within the coronal pulp, one notes a massive inflammatory cell infiltration with small areas of tissue disintegration. C The bacteria within the dentinal tubules attract neutrophilic granulocytes. "Empty spaces" in the subodontoblastic layer represent micronecrosis, with pus accumulation and polymorphonuclear granulocytes. D Granulocytes dominate both perivascularly as well as intravascularly; this is the picture of persisting chemotactic irritation. Larger "empty spaces" represent initial tissue necrosis. One also notes plasma cells and macrophages, which produce cytokines and chemokines, leading to chemoattraction of leukocytes. These mobilize monocytes, neutrophilic granulocytes, and other effector cells, attracting them to the focus of infection. Of the ca. 600 bacterial species present in the oral cavity, only a small number are seen in an infected root canal. The frequency of individual bacteria can vary between 100 to over 10 million. The size of a periapical lesion correlates with the total number of bacteria and their species. A greater variety of bacterial species can be isolated from root canals in teeth with larger periapical lesions. The dynamics of bacterial infection within root canals was studied in a series of animal experiments. In teeth whose pulpal tissues were infected with bacteria from the saliva and subsequently tightly sealed, early examinations revealed a preponderance of facultative anaerobes; after six months, however, the number of these bacteria had decreased to 2 %. The proportion of obligate anaerobic bacterial strains increased with time. It was concluded that a selection mechanism within the root canal enhanced the development of specific environmental conditions. Within root canals, bacteria often exist in symbiosis. For example, one often observes Fusobacterium nucleatum together with Pep-tostreptococcus micros, Wolinella recta, Por-phyromonas endodontalis, and Selenomonas sputigena. Numerous factors can influence bacterial colonization of the root canal. Some bacteria can use the metabolic by-products of other bacteria as nutrition. In addition, bacteriocin, which is released from certain microorganisms, can inhibit or enhance the growth of other bacteria. Some bacteria in an infected root canal release enzymes that increase the pathogenicity of the bacteria. For example, immunoglobu-lins from the host organism can be inactivated by P.asaccharolyticus and P.endodontalis; P.intermedia and P.gingivalis degrade complement factor C3. Both are important opsonins for the phagocytosis of these bacteria during the host defense process. P.gingivalis can simultaneously break down proteinase inhibitors that are important for maintenance of the integrity of the still healthy tissues surrounding the infection. A necrotic pulp without bacterial infection never leads to the formation of a periapical lesion. Only in the presence of bacteria will apical periodontitis develop. A persisting microbial infection is the primary reason for endodontic failure. According to recently published studies, the microbial composition of a failed root canal procedure differ significantly from that of an untreated, infected canal: The necrotic pulp exhibits a polymicrobial colonization, consisting of four to seven species, predominantly anaerobes, in approximately equal numbers of gram-negative and gram-positive bacteria. In contrast, in previously treated root canals with persisting periapical lesions, usually only a single species (monoinfection) is found, usually Entero-coccus faecalis. Gram-positive microorganisms predominate at 83.3%. In 57% one notes facultative anaerobes, and in 42.6% obligate anaerobic bacteria. The presence of Pepto-streptococcus is usually associated with clinical symptoms. A/B The progression of the carious process has led to exposure of the pulpal tissues, which exhibit tissue necrosis of the coronal pulp as well as large portions of the soft tissue within the root canals. Apical periodontitis is obvious in the periapical regions. C Using histobacteriologic special stains, it is possible to identify the reddish-stained bacteria within the necrotic tissue. D Coronal pulp and the coronal aspect of the root canal tissues contain bacterial conglomerates. E This high power view reveals phagocytosed bacteria within neutrophilic granulocytes. This shows the active defense capability of the endodontium; however, once the bacterial infection becomes too massive, the host response is overwhelmed. F Within the area of periapical inflammation, no bacteria can be identified histologically. Pulpal necrosis is an irreversible condition characterized by tissue destruction. It can occur locally, or within the entire coronal pulp, or in both coronal and root canal pulp. The primary etiologic factor in pulpal necrosis is bacterial infection and the subsequent inflammatory host response; the expanse of the necrotic process is directly correlated with the magnitude of bacterial invasion. Differences exist between coagulation necrosis and liquefaction necrosis. Coagulation necrosis involves lethal cell damage in which oxidative phosphorylation collapses as a result of damage to the mitochondria. Intra-cellular and transcellular transport processes shut down, and phospholipase-induced collapse of both cytoskeleton and cell membrane occurs. Released proteolysates attract granulocytes into the area of necrosis. A special form of coagulation necrosis is gangrene. This represents a summary effect of necrosis with desiccation, which inhibits both bacterial growth and autolytic destruction ("dry type"). The "wet type" of necrosis is liquefaction necrosis, which is caused by a primary or secondary colonization by anaerobic bacteria. In liquefaction necrosis, enzymatic tissue destruction predominates. If the carious process reaches the pulp and exposes it, studies demonstrate that there is always necrosis of the coronal pulpal tissues. The coronal pulp of all such teeth becomes partially or totally necrotic, but only in two-thirds of cases is the root canal pulp involved. Coronal pulp always exhibits bacteria, but in only one-third of teeth is the root canal colonized. In 90% of all patients studied, a periapical radiolucency occurs early on. The condition of the pulpal tissues within the adjacent lateral canals corresponds to that of the suprajacent pulp. If the pulp of the primary canal is necrotic, the process extends also into the lateral canals; at such locations, a lateral lesion can also develop. If the pulp is vital, however, the lateral canals also maintain vital tissue. In the case of apical periodontitis, the coronal pulp and some of the root canal pulp are already necrotically involved; however, there is usually remaining vital pulp tissue between the necrosis and the periapically inflamed tis sues. As a result, with apical periodontitis the lateral canals are relatively seldom infected, and therefore the primary indication for apic-oectomy with apical periodontitis is not fulfilled. It is impossible to ascertain clinically the precise time point when bacterial infiltration of the pulpal tissue occurs. Long before carious exposure of pulpal tissue occurs, abscess formation and tissue necrosis begin. The etiology of early and severe pulpal destruction includes bacterial endotoxin, released by the death of gram-negative bacteria. High concentrations of endotoxin are inherently toxic and cause tissue necrosis; low doses, on the other hand, lead to elevated cell proliferation and collagen synthesis, as a manifestation of host response. Bacteria elicit tissue necrosis, and are seldom observed outside the area of necrosis. Corresponding to the picture of a normal host response/reaction, the zones of necrosis are surrounded by neutrophilic granulocytes and macrophages that exhibit evidence of an active phagocytic process (bacteria contained within). Simultaneously, extracellularly released lysosomal products destroy the pulpal tissues. Bacteria penetrate not only into the necrotic area, but also into adjacent dentinal tubuli. Appositions (fibrodenticles, diffuse dentin deposits), and also areas of resorption, occur in areas of necrosis. A The carious process has led to coronal openings into the pulp chamber. The coronal pulp is necrotic and an abscess has formed. B The tissue is lytically destroyed; no cell nuclei are stained. C-E At the transition to the root canal pulp, one notes necrosis of the pulp tissues and in the apical direction an incipient tissue necrosis. In this region, one notes a massive accumulation of inflammatory cells. Coronally one sees a free denticle, which effectively closes the entrance to the root canal. F-G Within the area of tissue destruction, one observes neutrophilic granulocytes, where enzyme release causes further tissue destruction. Why after Pulp exterpation secondary dentin forms in root?